She has interviewed Tom Hanks, feminist author Bell Hooks and even Malala Yousafzai. But finally, British actress Emma Watson got a one-on-one with Geena Davis as part of her year-long sabbatical from acting to focus on her mission to raise awareness about gender equality. It was basically a women in film interview dream come true. The UN’s He For She gender equality ambassador, and Oscar-winning actress Geena Davis who created the Geena Davis Institute on Gender in Media, sat down for a chat about their respective careers, and why it is the statistics about gender inequality in Hollywood that make the issue all the more important to talk about. Geena first explained to Emma why she started her institute. She said after having her daughter and seeing the media she was consuming as a young child, she began to notice certain aspects of the content that she wasn’t as aware of before. “I had no idea there was anything wrong with kids’ media…I started watching little preschool shows with her or G-rated videos or whatever; I couldn’t believe what I was seeing, that there seemed to be far more male characters than female characters in what we make for little kids. It was just a shock,” she said. It wasn’t until she started talking to her friends who also had children and pointing out her findings that she realized her observation sadly wasn’t common. “Then I decided to bring it up within the industry. I knew a lot of people, so I’d say, ‘Have you ever noticed how few female characters there are in kids movies?’ when I met a director, a producer, whatever. And they said, ‘Oh, but that’s not true anymore.’ Then they would name a movie with one female character as the proof that things had changed,” she said. It was the attitude about tokenism that pushed Geena to do more than just tell people about what she was seeing more and more of, but gather the actual numbers to show people in positions of power in the industry. “I thought, ‘I want to get the research, because I’d like to know if I’m right.’ It wasn’t so I could go educate the public, really. It was so I could go back to the people in the industry and present it to them and say, ‘See, it really is still a problem’…We sponsored the largest amount of research ever done on gender depictions in TV and movies. Then we go meet with every studio, every guild, every network, every production company and share it with them, privately. I don’t really bust anybody publicly. It’s much more efficient if I can impact the creators,” she said. Given that Hollywood is arguably one of the most powerful forms of communication and influence the planet has ever seen, making a change from the top down within the industry is no easy task and certainly something to be applauded. Emma admits that it also took her a while to really see the differences in opportunities men and women get in Hollywood, but ever since she caught onto the idea of inequality, she would recall aspects of her own life growing up which showed inequality: two thirds of her school were boys and one third girls, and most of the characters and crew on ‘Harry Potter’ were men. 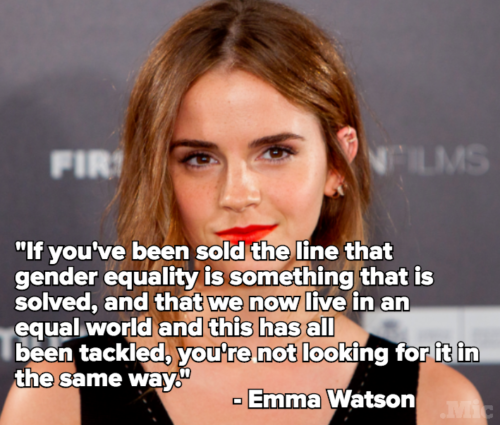 “I think until you really start looking at it, if you’ve been sold the line that gender equality is something that is solved, and that we now live in an equal world and this has all been tackled, you’re not looking for it in the same way. You’re not really aware, you’re not looking at it consciously. I would say there have been different stages of my feminist awakening. The more layers you peel back and the more things you’re made aware of, you’re like, ‘Oh my God’,” said the actress. Geena’s experience, however, was slightly different. Early on in her career she was making the types of films that really pushed the envelope in terms of female representations. 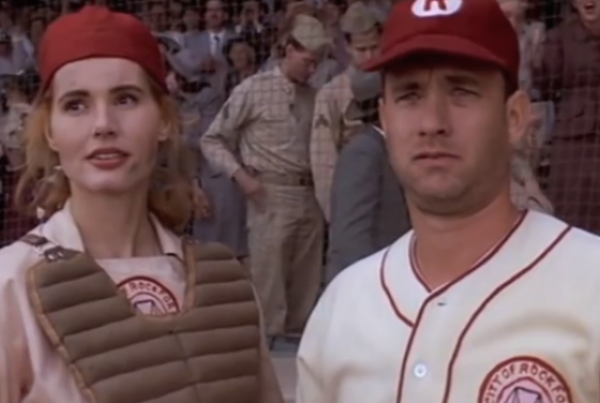 In ‘Thelma and Louise’ and ‘A League Of Their Own’ she played characters who were bucking the social traditions for women, and at the time she was convinced that things were changing. But close to 2 decades later, she admits it has not. Both of the women discuss how Geena’s research has become an important tool which can help shift focus in the industry, and make the required changes, which the ‘Long Kiss Goodnight’ actress says is much easier once you have the hard data. “I think that why the research and the data are so important is because you become so used to seeing the world one way that you don’t even notice anymore. It has this invisibility,” said Emma. “That’s the really frustrating thing, but also the fixable thing. My theory why no one notices is that that’s the ratio thing they grew up with. It’s just been that way forever, so they don’t see it,” replied Geena. One of the things we love about the gender equality advocate is her optimism and positioning of this issue from a place of positivity, rather than anger. When you lead with optimism it becomes a much easier sell to those who aren’t aware of it. There’s a good reason why Geena is more hopeful about this issue than most. “I realized that in all the sectors of society where there’s a huge gender disparity, the one place that can be fixed overnight is onscreen. You think about getting half of Congress, or the presidency … It’s going to take a while no matter how hard we work on it. But half of the board members and half of the CEOs can be women in the next movie somebody makes; it can be absolutely half,” she explained. Her whole aim is to ensure an entire generation of boys and girls get to grow up with the knowledge that every human is equal, and that there is nothing that a woman shouldn’t or can’t do simply because of her gender. It’s a goal all of us should want for tomorrow’s leaders. “Our slogan is, ‘If they see it, they can be it.’ So if we show fictional characters doing cool stuff, then girls will want to be it in real life,” she said. Coming from a younger generation than Geena, Emma says she can see the ways the subconscious messaging directed at girls impacted what she thought was possible growing up. “I’m always convinced that the reason that I didn’t take as many politics or history classes is because I just didn’t see any women. I didn’t think when I was 13, 14 that that had anything to do with me. I just didn’t see women in my textbooks. I didn’t see many female politicians on TV. I didn’t see women in history textbooks, so I did geography, and art and English literature. But I know I must have been affected by not seeing women represented,” she explained. Seeing women represented on film becomes not just a way for girls and women to look at characters on screen, but they become important cultural role models in a sense, because they can open up a world of possibility that perhaps didn’t exist before in a girl’s mind. Geena mentions how the increase of female forensic scientist roles on TV in shows such as ‘NCIS’, ‘CSI’ and ‘Bones’ has affected the real world, where something like two thirds of forensic scientists are now women. For her personally, her aunt was the first feminist role model she had. Growing up in rural Vermont where traditional gender roles were the norm, her aunt was the woman who would travel the world, go scuba diving, go to dinner theater performances by herself, and had a career. “I was really lucky that I had an aunt who was very inspiring to me. She was different than anybody in my family on either side. I was 16 or something. She broadened my understanding of what women could be like and do and that there’s a big world out there. So she had a huge impact on me,” she said. 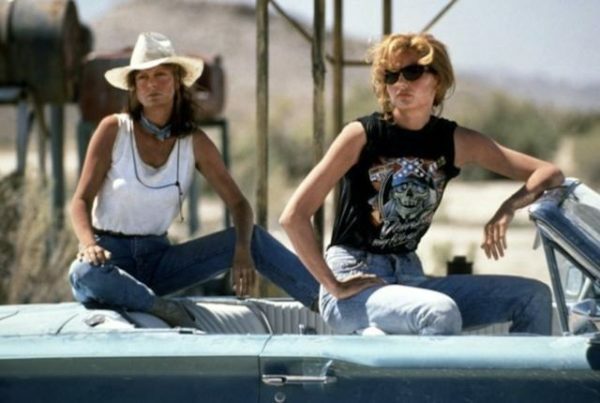 Another woman who later became a huge influence on her film career and how helped her shape her voice, was none other than Susan Sarandon, her co-star in ‘Thelma and Louise’. Geena talks about a pivotal moment which made her realize the importance of women speaking up without apologies. The two actresses were set to meet with the director, Ridley Scott, and Geena remembers being very passive about the ideas she had, and was blown away to see how forceful Susan was about the changes she wanted. “I would think about each [change] and say, ‘Well, this one can wait till the set because I don’t want to bring up too many things’, ‘This one, I bet I can make him think it’s his idea’…The most wimpy, girly, manipulative techniques I came up with … So I meet Susan, and she was amazing. We sit down to go through the script. I think it was page one—she says, ‘So my first line, I don’t think we need that line’…My jaw was to the ground. Because she was just saying what she thought! She was saying her opinion. I was like, ‘People can do that? Women can actually just say what they think?’ It was an extraordinary experience to do that movie with her because every day was a lesson in how to just be yourself,” she recalls. Emma concurs that the visibility of women modeling what assertiveness looks like, can have a major impact on the rest of a girl’s life. “I’ve had so many moments where seeing other women be fully and truly and authentically themselves, and express that, has given me permission. Once you see it happening, you’re like, ‘Oh, I have permission to do that, too,” she said. There are so many more great moments from this interview, including Geena retelling a story about meeting the first democratically elected female president of Iceland, whose rule for 16 years was so impactful that there were young boys writing letters to her asking “Madam President, do you think it will ever be possible for a boy to be president?” the same way girls are doing in the US today, and how a key piece of advice from Susan Sarandon helped Geena while giving birth to her child. Click here to read the full version in Interview Magazine, and be inspired.